RF3 - Timeline Television Ltd. The purpose-built 5 tonne 4K RF uplink truck provides a dual chain 1.8m Advent Newswift antenna, capable of delivering multiple HD and UHD uplinks. 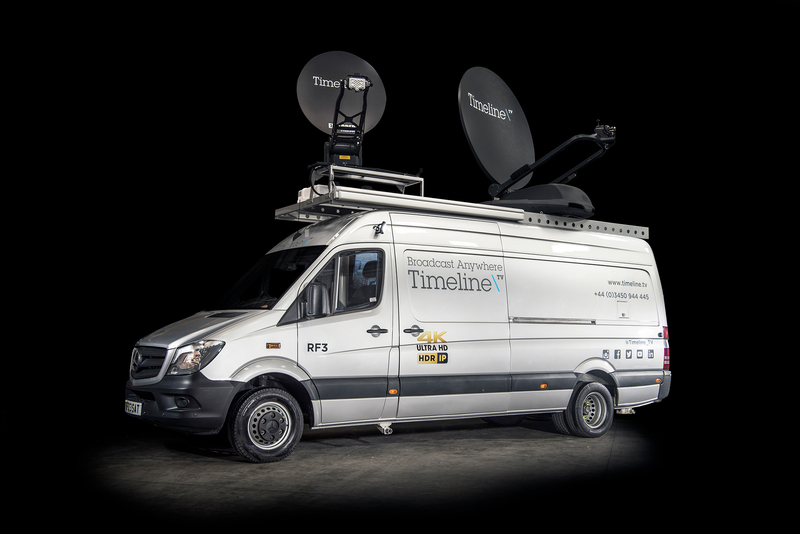 As well as being a traditional RF uplink truck, RF3 has been designed to be ﬂexible and completely customisable to clients’ needs. It can be used, for example, as a complete outside-broadcast unit, as a communications hub or as a newsgathering uplink truck. With a large 196 port bi-directional 4K router and a 32-way multiviewer, RF3 can handle large complex assignments with ease. Fitted with two H.265 ultra low latency encoders and four H.264 encoders, RF3 handles high quality low bandwidth HD transmissions or multiple 4K transmissions with ease. RF3 has a 1m fast acquisition Ka band antenna providing remote data services or video over IP. The 9m mast has a headload of 35KG allowing an array of antennas to be mounted for radio camera and talkback.